Georgians go to the polls again on Sunday, 27 October, to vote for a new President at the end of the eventful ten-year administration of the incumbent, Mikhail Saakashvili. According to the Georgian constitution Saakashvili cannot run again, after having served two terms. The election comes just a year after the historic October 2012 Parliamentary election that saw the first peaceful transfer of power between opposing political groups through the ballot box in the Caucasus region. After the excitement, drama and high voter engagement of last year, this year’s election by contrasts risks turning into something of a non-event. Observers are already noting a certain amount of voter apathy. Part of this is voter fatigue, part is also due to the fact that the importance of the Presidency in the new constitution set-up that the previous government led by the United National Movement (UNM), had enacted in 2010 has greatly reduced the importance of the Presidency. In effect, except in times of war or national emergency the President now has to work through the Prime Minister and the Government. Once the new President is elected Georgia stops being a Presidential Republic and becomes a Parliamentary republic. Georgians, used to a strong national leader, remain quite ambivalent on the virtue or otherwise of this change. This has not stopped tens of Georgians from putting forward their names as candidates, amongst them some who have been around the Georgian political scene for decades. However general opinion is that this will be a three-horse race involving Nino Burjanadze, who served as Parliamentary Speaker under both Shevardnadze and Saakashvili, David Bakradze, who replaced her as Parliamentary Speaker under Saakashvili, and Giorgi Margvelashvili who served as Minister of Education in the Ivanishvili government after last October’s Parliamentary elections. 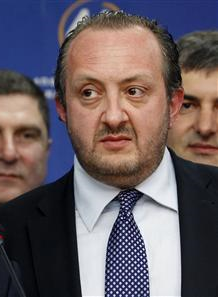 Although Burjanadze may have harboured Presidential ambitions for some time, the other two are fairly newcomers to the Georgian political scene, and in many ways some Georgian voters see all the three as proxies for stronger patrons. This however is an injustice to all three who in their different ways have already made a positive contribution to Georgian society and offer clear alternative models from which the Georgian voter can choose from. Burjanadze became a national figure when in 2001 Zurab Zhvania was forced to resign as Speaker of the Georgian Parliament after splits within the ruling Citizens Union of President Shevardnadze. Burjanadze was elected Speaker in a tight vote in the Parliament , with the backing of Zhvania. In the 2003 elections she was part of a coalition ticket with Zhvania, and after the Rose Revolution she emerged as the third person in the triumvirate Saakashvili-Zhvania-Burjanadze. She manipulated tensions between Saakashvili and Zhvania in order to carve a role for herself, but following Zhvania’s untimely death in 2005 her value for Saakashvili was greatly diminished, and she was increasingly marginalised, until eventually forced out of the ruling team completely. She then tried, very unsuccessfully to mobilise opposition to Saakashvili. In 2012 she was refused a place in Ivanishvili’s coalition, and took a back seat in the election, but was the first person to turn up at Ivanishvili’s house to congratulate him after his election victory. Whilst for many years projecting herself as a pro western reformer, in recent years disillusioned with western support for Saakashvili she has had several meetings with president Putin and has taken a pro Kremlin position on many issues. In the current election campaign she is calling for more tough measures against those who committed crimes under the Saakashvili government, and has recently spoken of a golden ticket with her as President and Ivanishvili as Prime Minister, although it is clear that the latter has been trying to distance himself from Burjanadze. Bakradze was catapulted to the centre of Georgian politics when he was chosen by the ruling United National Movement as the new Chairman of the Georgian parliament once Burjanadze was ousted. In many ways he represented the “soft” side of the Saakashvili government, not getting involved in many of the excesses connected particularly with the law enforcement bodies. However he is widely criticised for having turned the Georgian parliament into a rubber stamp parliament for the Saakashvili government, killing all attempts at government scrutiny and simply acting as the nice face of the government. His choice as the candidate of the United National Movement in the election came as a result of an internal consultation process which the Party called primaries. With the strongest contender for the nomination, former Prime Minister Vano Merabishvili in jail, Bakradze’s selection was in many ways Hobson’s choice, since the only credible alternative, Gia Baramidze only has support amongst a limited faction of the UNM. 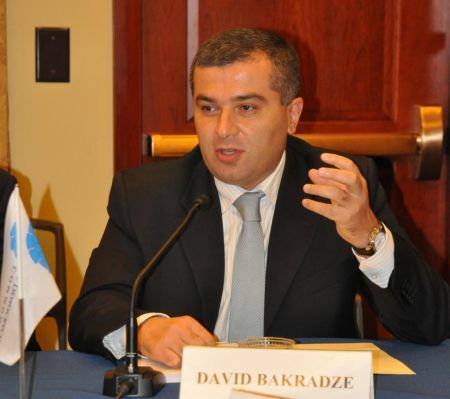 Bakradze has been trying to focus his campaign on the future rather than the past, but has called on the UNM to recognise its mistakes whilst in office. Whether or not the Georgian people will believe him is however yet to be seen. 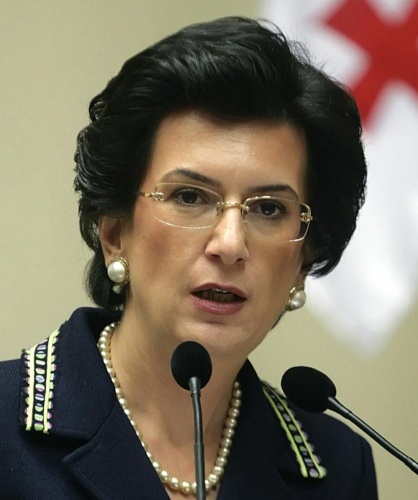 If Bakradze was catapulted to centre stage, Giorgi Margvelashvili was anointed to the position by the decision of Prime Minister Bidhzina Ivanishvili, a decision which was later formally endorsed by the Georgian Dream coalition. Margvelashvili only held official positions for a very short time after October 2012 and remains for many, including the vast majority of the Georgian voters, an unknown quantity. His background within the NGO network may serve him in good stead in Vera and Vake (the middle class districts of Tbilisi) but for others he is the NGO boy from down town. Many think that Ivanishvili’s popularity in Georgia remains still so high that Margvelashvili will be elected simply on the basis of that. Certainly his efforts to connect with the voters so far have been disappointing, but the Georgian Dream is these days the only Party that has the organisational capacity to operate nation-wide, and this will certainly have an impact on the vote. Many consider that if elected, Margvelashvili will be an effective, clear-headed President but questions remain about his inexperience. The questions being asked in connection with this election is not if it is going to be free and fair. Everything indicates that Ivanishvili will be true to his word and will try to ensure the best conditions for a free and fair election. But if voter apathy turns into low voter turnout it could very easily turn into an election flop. Ivanishvili has already warned about voter complacency, and he is right. As Georgians return from their summer holidays it is expected that the campaign will pick up over the next days and weeks. A good Presidential election, following the important achievements of last year, will undoubtedly contribute a lot towards Georgia’s political credibility internationally, and will earn for the country brownie points in its endeavours to integrate with the European and Euro -Atlantic institutions. It will also help break a psychological barrier of Georgian distrust of the electoral process. For this reason, if for no other, everybody should contribute to make this election a success. This article was prepared by the Caucasus Elections Watch news team.